To aggressively enter the European, one of the world’s biggest tire markets, NEXEN TIRE is constructing a plant in Zatec, Czech Republic, and is sponsoring the country’s art and culture scene. Let’s look more closely into NEXEN TIRE’s expansion of its marketing scope from sports to culture. 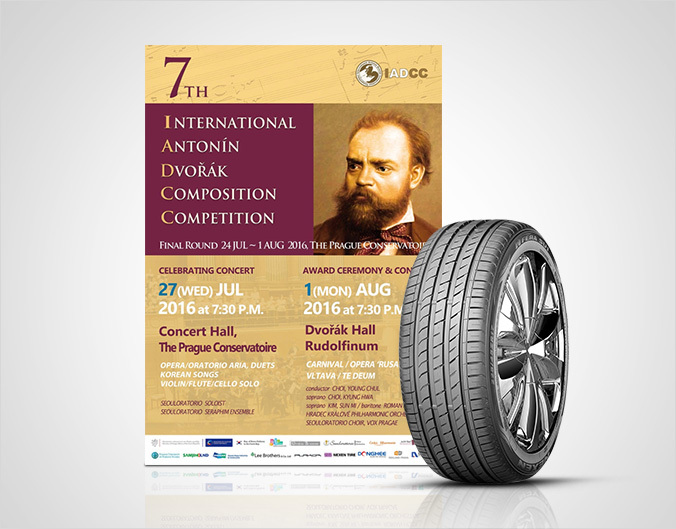 NEXEN TIRE is an official sponsor of The 7th International Antonín Dvořák Composition Competition that was held from July 24th to August 1st at the Prague Conservatoire in Prague, Czech Republic as part of a cultural marketing strategy. The International Antonin Dvořák Composition Competition was founded to honor the composer Antonin Dvořák and to discover and foster young and talented composers around the world. It provides composers with opportunities to compose, record, and host recitals. With this official sponsorship, NEXEN TIRE bestowed a special sponsor-award engraved with its label, NEXEN TIRE, to the third place winner. Also, NEXEN TIRE had a chance to showcase its brand to all of the participants from around the world through related posters, pamphlets, brochures, and websites. “By officially sponsoring domestic and international competitions and recitals, we wish to strengthen communication with a variety of consumers who have a shared love of culture. Through this event, we will enhance our brand awareness and create a long-term channel for communication with consumers. Further to this, the company will actively pursue cultural marketing strategies to approach the public as a more familiar brand”, commented NEXEN TIRE. NEXEN TIRE will establish various communication channels with customers and further activate cultural marketing so that it can approach customers as a more familiar brand. Keep your eye on NEXEN TIRE that will become more actively engaged in not only motor sports that are directly associated with tires, but also culture and arts!